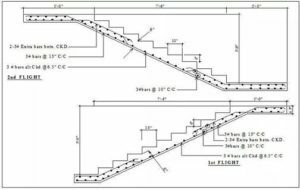 RCC stairs may be the most common stairs widely used than any other types of stair. These stairs can be easily moulded to any desired shape and are better wear and fire resistant. The steps of RCC stairs are made by using ordinary cement concrete. Besides ordinary cement concrete, some other superior finishing materials are also used such as marble, terrazzo, tiles etc. to give them better appearances. 1. R.C.C stairs are better fire resistant than any other stairs. 2. They are adequately strong and more durable. 3. The steps are non-slippery. 4. They offer better and pleasant appearances. 5. The stairs can be designed for greater widths and longer spans. 6. They can be easily cleaned. 7. R.C.C stairs can be precast or cast in situ. 8. The maintenance cost is almost nil. 9. In modern sky scraper construction always framed structures are adopted, for such structures R.C.C stairs are the one and only stairs which can be used. Also Read – Advantages Of R.C.C Framed Structures Building. Liked This Article? Then Please Subscribe To Our Daily Newsletter. WHAT IS REINFORCED CEMENT CONCRETE?